The stem is simple, erect, and has no branches. It is covered with hairs. The leaves are clustered radiating the stem and becoming smaller at the top. The margins are toothed. 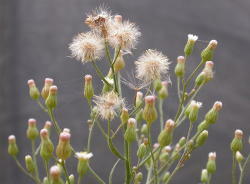 The flower head is highly branched that arising at the top of the main stem with white or yellow or pink flowers. Horseweed infests most agricultural lands. Its numerous seeds easily mix with the harvested cereals and beans and are the source of infestation for the next cropping season. It is an alternate host for most agricultural pests. Its stem has medicinal properties. It is made into a tea to treat diarrhea and kidney and respiratory problems. Oil of erigeron is taken from the fresh plants and used against intestinal parasites. Studies shows that horseweeds become resistant to Paraquat, Atrazine, Glyphosate at some corn, cotton, and soybeans farms, pastures, orchards, vineyards in some parts of Europe, USA, and Japan (Weed Science, 2005). Proper seed selection and proper choice of cultivars. Regular field monitoring. Scout your field to identify the weeds and to know what immediate actions to undertake. Cutting the weeds before they flower.